Nyd balkonen, vestsiden, solen i en velkomstdrink. Bedøvelse østsiden så stå op med solen, og fuglen på gården, Stille kvarter. Nem adgang til monumenter, til dit tog fra lufthavnen. 2 busser 21 og 27 lige der, gå til Luxembourg, St Michel, Conciergerie, Louvre, Musée d'Orsay, Opera og bigs butikker. Ned ad gaden 91Going til Montparnasse og Bastille og 83 til Champs Elysees, Grand og Petit Palais, Quai Branly og tæt på Tour Eiffel ... Jeg tror, ​​du gjorde det meste af touring. Subway Censier Få dig der også. For de bedste resultater kan du kontakte først !!! Adrian, ansvarlige er også taxa og kan hente dig i lufthavnen eller togstationen, hvis du ønsker det. Nøgleord: Meget fredelig lejlighed, solrig, 5. sal med elevator, 50 m2. Tæt på monumenter, universiteter, restauranter og transport. badekar og bruser. Antique vask (1920) .Decoration med glas fliser ved ejer og fusing glas vindue. Vaskemaskine. Håndklæder driing radiateur (om vinteren). Toiletter er adskilt. Cheminée 1920. original. Ikke tilladt at gøre brand i Paris, Artist arbejde i glas, maleri fra familie. Objekter fra 1950. Nice apartment with good balcony in residential left bank. This apartment had good cross-ventilation which can be important in the summer. The kitchen needed repair, but I am sure that would have been taken care of after we left. The metro is not very close, but bus line is across the street. Genevieve was helpful when we needed her. We enjoyed breakfast with rooftop views from the balcony every morning. Quiet, good location with stores nearby. I am glad you enjoyed your time and bus ride,more wonderful to look at Paris monuments.Metro is 10 minutes but buses are just across,that of course eliminate to want to walk !! !I do to but I bike ,so not often. The assurance still working on the ceiling problem.the link come from the building so more administrative work ....But if do you not look up every thing is wonderful and work. What a great welcome - to arrive off the plane from California and be welcomed by Raffael in his family apartment! The space was easy to find, large (by Paris standards), clean and attractive. It included a well appointed kitchen. The proximity to the famous Rue Moufftard made home cooking a daily adventure. The family was able to guide us to music, gardens, art and shopping - including a free museum night and walks to the Jardin Luxembourg and Jandin des Plantes. A bus that stopped directly across the street from the apartment made for easy travel to activities on Paris. We were advised to purchase a Navigo pass and a sim card for our Iphone from Freephone. They made getting around Paris easy and reasonable. 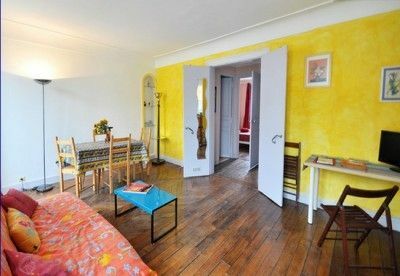 I recommend this apartment for a Paris stay. It is perfect for a couple and can accommodate a visitor on a futon couch in the living room. The 5th arrondissment is historic and fun, near enough to parks and shopping, yet where Parisians actually live. After a month we felt part of the neighborhood. We were sad to leave this place. Thanks for coming sharing our place and the rewiew .It was a plasure to help you ( even the lost passeport..!!) but we could have a glass of wine on the balcony.. I hoppe next time you come in Paris we can share some others activites and drinks.. Thanks for taking care of the place .Enjoyed your family and California. I really enjoyed my stay at Genevieve's apartment. She and her family were extremely welcoming, and everything about the apartment was easy to understand and operate. Having spent several months freezing in Paris rentals, I was especially appreciative of the excellent heating. The windows kept the cold out, but the radiators made it cosy, and this was a particularly cold and unpleasant January, weather-wise. The location was good-- plenty of small markets and bakeries in the immediate vicinity, and the Rue Monge and Mouffetard markets in walking distance. Also lots of good neighborhood restaurants. I learned to use the 21 and 27 busses, but it was also no big deal to reach St Michel and St Germain on foot. So the apartment gets a good Walk Score. When my daughter came for a week, we were able to separate the bedroom and living room (futon sofa) completely, and the kitchen and bathroom were accessible from each room. A third person could have occupied the other twin bed in the bedroom if we'd wanted. All in all, a great month. The apartment is sweetly decorated (my favorite being the bird in the shower room). The lift worked fine, the building was very quiet, and the area very safe. I hope to come back! Danice ,thanks et merci beaucoup.Even the doctor is close by if needed !!!! This was a great experience start to finish. Genevieve was very communicative from her phone call the day I submitted my booking request, through emails providing information about transportation to the apartment, to our arrival when she sat down with my friends and I and provided us with a map and recommendations of things to see and do in Paris. Her tips were spot on and much appreciated. The apartment is in a great location in the 5th arrondissement, walkable (for us, this means within a few miles) or a short Uber ride to everyplace we wanted to go. The apartment itself was perfect. We were three friends traveling together, and she arranged the beds to our specifications, with two individual beds in the bedroom, and the pull-out sofa in the living room set up for sleeping. The kitchen was well-appointed with everything we needed, and Genevieve was kind enough to loan us her small trolley for carting groceries from the store. The balcony was a dream. We loved enjoying our coffee and breakfast there each morning, and finishing each night with wine enjoying the breeze. We also liked that there was a toilet area separate from the bathroom, so we could still use the facilities while someone was showering. Overall a great experience, would definitely rent from Genevieve again if I make it back to Paris. Thank you verry much,did you have chance to do some of suggestions or the plan is to come back ?!!!!!! Die Wohnung ist hell und freundlich und mit der Terrasse ein absolutes Highlight! Nach dem Shopping und Sightseeing den Tag mit einem Apéro auf dem Balkon ausklingen lassen, einfach wunderbar. Bus und Métro sind in unmittelbarer Nähe, dabei ist die Lage sehr ruhig. Geneviève ist eine freundliche Gastgeberin, die jederzeit für unsere Fragen da war. Ich kann die Wohnung allen empfehlen. Merci beaucoup ,en vous souhaitant une fin d'année pleine de champagne en famille et amis. Film, bowling, gåture. besøger alle over Paris og omkring.